In the March 2017 of WindCheck magazine, Kate Wilson (North Kingstown, RI) gets some deserved love that we are pleased to share. Named after the Ocean State’s 66th Governor, RIMTA’s John H. Chafee Boater of the Year award, a beautiful half hull with a plaque engraved with such names as Ted Hood, Halsey Herreshoff, Ken Read and Rome Kirby, acknowledges an individual who has contributed to the success of the recreational boating industry in Rhode Island or championed the cause of bringing recreational boating to the public. As a former sailing coach at Rogers High School in her hometown of Newport, Kate saw that many students with requisite skills and experience to join the school’s sailing team were choosing other sports instead. After years of competing, these young sailors were simply burnt out. Kate puts her own advice into practice with much success. As a member of Newport Yacht Club, she led the effort to revitalize the club’s junior sailing program. The program was renamed the Marine Adventure Camp, larger boats were added to the fleet, and she placed an emphasis on fun adventures with friends. In just two summers, a program that had dwindled to about a dozen kids grew to 120. 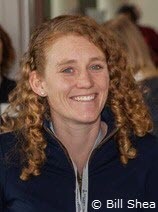 Noting that her approach is not meant to denigrate competitive sailing, but to give kids who are not motivated by racing other ways to develop a passion for the sport, Kate says, “Sailing is more than a sport or hobby. It’s a way of life, a community, a family, and teaches us skills that go beyond the water into our professional and personal lives.